A massive asteroid that may be on a collision course with Earth should be studied in more detail, according to a former Apollo astronaut who specializes in monitoring potentially hazardous space rocks. 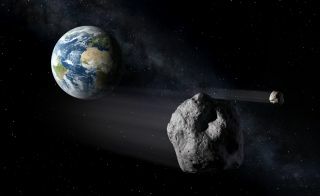 Asteroid 2011 AG5 has been the object of attention because scientists say it may swing close to our planet in the year 2040. The big space rock is on NASA’s impact hazards list, but more definitive tracking of the object is still needed, scientists say. In fact, some near-Earth object (NEO) experts say it’s time to start hammering out a plan in case the asteroid needs to be deflected. Former Apollo astronaut Russell Schweickart is calling upon NASA to undertake a detailed engineering and mission planning analysis of 2011 AG5. Keyholes are small regions in space near Earth through which a passing NEO may be perturbed — due to gravitational forces — placing it onto a path that would strike Earth. In this most recent communiqué, Schweickart questioned a view held by Bolden from an earlier exchange of letters between the two that a Deep Impact-like intercept of asteroid 2011 AG5 could be staged in enough time to derail a space rock from hitting Earth. NASA’s Deep Impact probe was purposely crashed into comet Tempel 1 on July 4, 2005. While Deep Impact was a very successful mission, it is a poor analogy for the potential deflection challenges presented by 2011 AG5, Schweickart noted. To depend on such an impact mission to justify waiting until after the next tracking opportunities — before doing any further engineering analysis — is ill advised, he said. Schweickart contends that a 2011 AG5 deflection campaign requires two missions, not one, as was used on Deep Impact. In addition, intercepting and impacting 2011 AG5 presents far more daunting challenges than was posed by comet Tempel 1. "To be clear, what I am asking for is specific engineering and mission planning analysis to be performed now in order to insure that we fully understand the timeline requirements, in the unlikely event that AG5 should be headed for the 2023 keyhole," Schweickart wrote. "We all realize it is highly likely that AG5 is not headed for an impact. But we must also hedge against the possibility that this will not be the case by being prepared to act, and not find ourselves awkwardly beyond the point where deflection remains an option," Schweickart concluded in his open letter to the NASA chief. In response to the letter, Schweickart told SPACE.com that a NASA-organized teleconference was held on March 8 involving himself, as well as John Grunsfeld, NASA's Associate Administrator for the Science Mission Directorate, Jim Green, Director of Planetary Science, and Lindley Johnson, NEO Observations Program Executive. "It was a very constructive discussion and as a result we will be getting together in the next few weeks to discuss the various issues and options which would apply to a variety of future scenarios regarding 2011 AG5," Schweickart said. "I’m looking forward to these substantive discussions and I commend John Grunsfeld and NASA for this positive response." Schweickart's new letter to Bolden, "presents points we at NASA have considered in looking at the 2011 AG5 scenario," Lindley Johnson told SPACE.com. "A big concern with any mission analysis is that they are only as good the initial input conditions. The results you obtain are always dependent on those conditions," he said. But, if the asteroid’s orbit isn’t that well defined, then a mission analysis would need to be mostly re-done after a better orbit is ascertained, he said. "We are certain we will have a higher confidence model after observations are collected in another orbit of AG5," Johnson said, "and we are confident we will have more than sufficient time to do both the mission analysis and undertake any response still necessary after that observation opportunity." "However, we will continue to study the AG5 situation, as we do continuously for all objects on the impact hazards list," Johnson concluded. "There are logical reasons to start really planning to do something really soon … and analyzing AG5 really soon," said Clark Chapman, a noted specialist in asteroids and a planetary scientist at the Southwest Research Institute in Boulder, Colo. It has been generally thought that 2011 AG5 can't be observed again until September of 2013, Chapman told SPACE.com. "That’s not true. We can see it again in August of this year." What’s needed is one of the largest ground-based telescopes on Earth, or the Hubble Space Telescope, Chapman advised. Doing so wouldn’t be too easy, "but in all probability could be done." For one, the asteroid is very faint and ground-based telescopes would need to slew toward the horizon in a really dark sky. "Telescopes are sort of designed to look more or less up … rather than over," Chapman noted. In the case of the Hubble Space Telescope, caution is the rule as it would be necessary to point the scope 42 degrees away from the sun to observe 2011 AG5, "but exceptions have been made in the past." Still, whether using these tools to eye the asteroid will improve our understanding of the asteroid's track isn’t a given. "We simply don’t know whether observations in August can make that much of a difference … but that's another arena in which studies should be done in the very near term," Chapman said. In the meantime, more information about 2011 AG5 is needed, Chapman said. "We don’t know how big this thing is," he said. "And if it’s on the big side, it would be hard to move it away from the keyhole with only a few years planning. And if it’s really big, it’s hard to move it away from the Earth if it goes through the keyhole." Chapman stressed that the most probable result of more tracking of the asteroid is that the 2040 impact of Earth probability will drop to zero. "I’m of the view that you can’t say, 'let’s just wait and the odds are likely to go to zero.' Yes, the odds are likely to go to zero…but suppose they don’t," Chapman said.